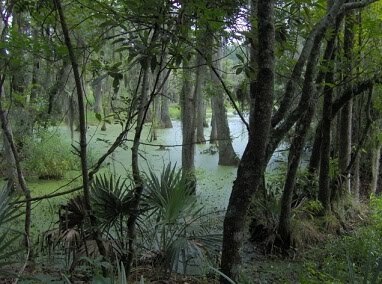 I have a thing for swamps. They look awesome, for one thing, and possess a certain alien mystery to them that I love. 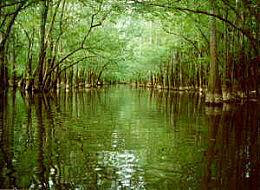 Swamps are scary, dark places, where the wet, slick weirdness of the sea has crept into the hard reality of solid land. It's a place where that which we can't survive in has invaded that which we can. Yet it's not the sea, with it's unreachable depths and the semi-weightless nature of water. It's land, albeit with waist-deep water and unsafe footing you can't quite see and god knows what lurking in those shallow waters. Swamps are, to our minds, stagnant, dead places. This isn't really true, swamps are as fertile as any other place, but the weird plants and the murky waters and cold mud tells our subconscious differently. And that makes them eerie places. Eerie places filled with eerie things. Especially in fantasy. In D&D, swamps aren't just home to alligators and snakes, but lizardmen, shambling mounds and the undead corpses of the swamp's former victims, buried just beneath the surface of it's inscrutable waters. It's a scary place full of scary things out to kill you, and god knows what else lurking deep within it, in those places nobody ever goes. And I think that makes swamps excellent places for adventures, especially those geared towards a bit of horror or mystery or just a little weirdness. They're a fusion of the known (land) with the unknown (sea) and that weird hybrid of a beast makes for a very cool place. So what exactly can you do with swamps? For one thing, as both a player and a DM, you can incorporate them into your characters. How does growing up or living around a swamp change a person? From the stench of stale water clinging to their clothes to the personal quirks and traits that come from living so close to a place filled with such alien dangers, it can be a good place to introduce some of the mannerism and quirks that often help shape fun, memorable characters. But it can also be used to a far more profound effect. With the druid, for example. Swamp druids are an interesting breed, who's odd native terrain can lead to very different kind of druid from the traditional, tree-hugging neutralist. Swamps in particular embody the dispassionate cruelty of nature, with unseen, swift death lurking in the cold eyes of every reptile that stalk its waters. Imagine then the druids who would choose to dwell there, finding kinship with the cold-blooded reptiles and gnarled trees. While not necessarily evil, such a druid would most likely strike most as even more detached from humanity than most druids, having no doubt had little contact with the hunters and poachers that most druids have to deal with. They could very well be cold or seemingly dispassionate when it comes to others, or possess an unnerving world view that simply divides others into prey and predator. Or maybe they see the world from a more detached perspective, and value human lives no more than they do, say, the life of a toad or water strider? Of course, while such things are fun to keep in mind while playing, visual or descriptive traits can often greatly help in conveying them to the rest of your group. So perhaps the druid wears the hide of alligators and other, stranger things instead of the fur and leather of other druids, or maybe they've eschewed clothes altogether, wrapped instead only in clinging algae and fetid growths, calling upon nature to form a suit of living armor around them when they need it. Perhaps they've adopted the mannerism or maybe even a few physical traits of traditional swamp animals, like scales, clammy, amphibian flesh or why not something more extreme, like fins or nictitating membranes? While there's no need for these traits to offer any game-related bonuses, their presence can greatly help enhance the oddness and disquieting nature of the swamp druid. And, if you wanna be really disgusting, have insects nest in their skin, botfly style. Where other druids are accompanied by wolves, bears and hawks, a swamp druids animal companions would more likely be snakes, lizards, alligators and perhaps even frogs or disease carrying insects like mosquitoes (probably in swarms). Or why not that most foul of first level encounters, stirges? Swamp druids are also probably more likely to come from lizardmen, seakin or bullywugs stock than the more traditional humanoid races like elves or humans, neither of which have a history of favoring the swamp as their territory of choice, though this is of course setting dependent, and you can change it up as you see fit. Still, crazy lizardfolk living in the swamp who control plants, talk to gators and are freakishly mutated and naked as they stride ominously from the swamp on misty morning? Works for me.